We had another big weekend of racing with excellent performances in the 10k in Pittsburgh and the 5k at Clarendon. Sam shook off the rust and ran a very solid 31:15, followed by Ryan Hanson in a PR of 31:38 which bodes well for a great season for him when he moves down to the distances that are his strength. Laura also ran a very strong season opening time of 36:49, and she is getting ready for a huge year, even by her very lofty standards. But the performance of the day belonged to Charlie who ran an excelllent 32:26, coming off a week of extremely high miles. On Saturday, Ryan Witty won the 5k in 15:02, followed by Dave Wertz in a PR of 15:29. Witty is going to challenge for top 5 at Clubs and Wertz continues to amaze with his dramatic improvement. Well done to all! 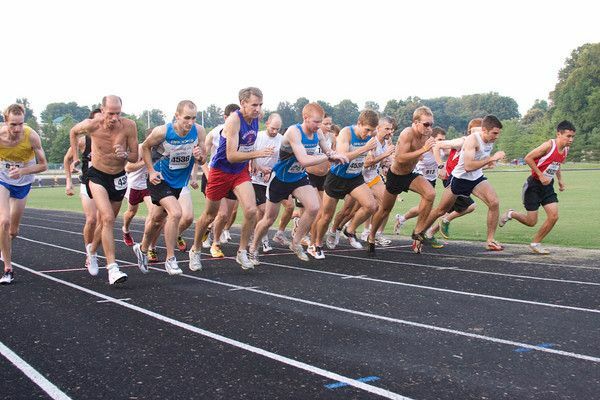 Karl is doing his final hard workout on Wednesday before his sure-fire Trials qualification in Chicago, which will be 4 x mile with a 3 minute rest in 5:15, 5:00, 4:45, 4:30, and he's going to need help to get through this. Men, if you love your country, this is your chance to stand up and be counted. The B group workout will be 2 x mile, 5 x 800, in 5:15, 5:00 (which by happy coincidence will allow you all to run the first two reps with Karl), then the 8s in 2:26, 2:24, 2:22, 2:20, 2:18 (with a 2:30 rest). I need at least one patriotic volunteer for the 4:45 and the 4:30. I realize the field of eligibles for the 4:30 is limited, so don't be shy if you think you can handle it. A grateful nation thanks you in advance. Who's in? We're back at BCC this week and we can roll at the normal time of 7:15.